For this reason, the event organised in Bradford by Near Neighbours, in partnership with Wellspring Together, was a great success, which saw more than 60 women from different ethnicities (Pakistani, Bangladeshi, Indian, Nigerian, White British), different religions, and different age groups, coming together to discuss how to tackle the problem. Some of the participants at the event in Bradford. The occasion was a facilitated discussion on the national Government’s Consultation Preventing and Tackling Forced Marriage, but the event became in addition an opportunity to give women from communities that are difficult to engage with the chance to talk to each other, share their experience and find a common voice. While addressing the questions of the consultation was quite difficult, as all women attending felt very strongly that they needed more information about the proposed “mandatory reporting” and its implications, it was easy instead to talk about the need for more education and engagement within the community and with individual families. 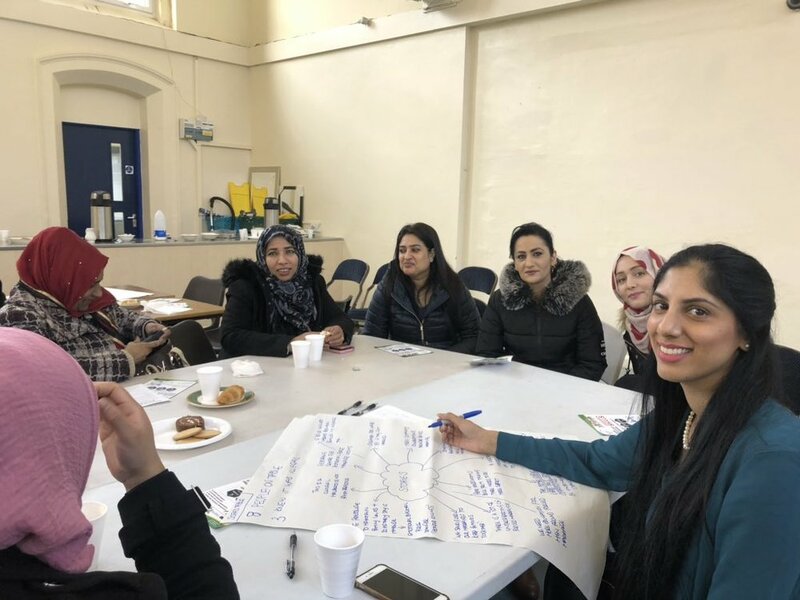 The principal element that emerged at the beginning of the conversation was that the great majority of women attending did not know that forced marriage was a criminal offence (under the Anti-social Behaviour, Crime and Policing Act 2014), though they agreed that it was right for it to be an offence. Many of the Asian women in the room had marriages that today would be classified as criminal (as they did not have any voice on the choice of their husband and on accepting the arrangements made by their parents) and explained that they went through the marriage as they wanted to keep their parents happy. The issues of pressure from the family, its perception, and the thin boundary between pressure and coercion were central to many of the table discussions: “where is the balance between advice from parents and coercion?” was asked. In addition, some women said that sometimes children themselves feel that a proposal by their parents cannot be refused, while some parents are open and willing to give their children a real choice. For these reasons, all the attendees stressed that it is very important to facilitate discussions and open conversations between parents and children, and to offer training to community leaders, as sometimes a neutral person could help having that discussion in a balanced way and avoid putting further pressure on the young person involved. They also highlighted the importance of education and support for parents (especially men), and the positive role that schools, health centres and community organisations can play, if they are not forced to report, as this instead could lead to a further division within the community and the risk of isolation for the victim. All participants agreed that it is important to have in place opportunities for education, discussion and mediation and that a more punitive approach should only be applied when those attempts have failed. As a result, they expressed some concerns about the Government’s proposal about mandatory reporting, which in their opinion may result in less reporting due to the damage it may cause to trusting relationships, and in more pressure to maintain family cohesion and honour. This may lead to less openness in dealing with public agencies such as schools, community centres and health centres because of the fear related to possible reporting, with the result of creating further division between agencies and communities. Despite the meeting being organised swiftly because of the consultation deadline just after the Christmas holidays, it managed to involve a great number of women and to give serious consideration to the Government’s recommendations. The real messages emerging from this event is that there is a group of women from the marginalised communities who are willing to engage on a very difficult issue for their families and communities. As a result of this event, they feel empowered and want to build further occasion of engagement: they want their families to learn, to organise and to receive support in order to give their children a real choice about their future life.